I was standing with the front door open, talking to Hubs. I noticed some movement by the road. So, I looked past him, identified the movement, and then turned to run and get my camera. and begin chasing following this critter along the ditch, down the road. Hello, my name is Bob White. Bob Q. White to be more precise. I found a new meme, which looks to be a lot of fun! in the Shoot. Edit. Submit. Meme. 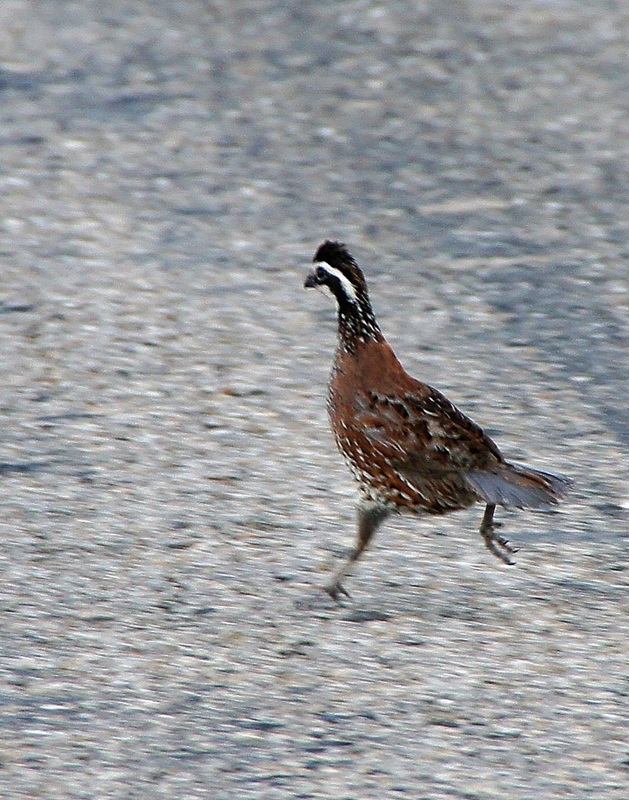 Quails are fast little critters. 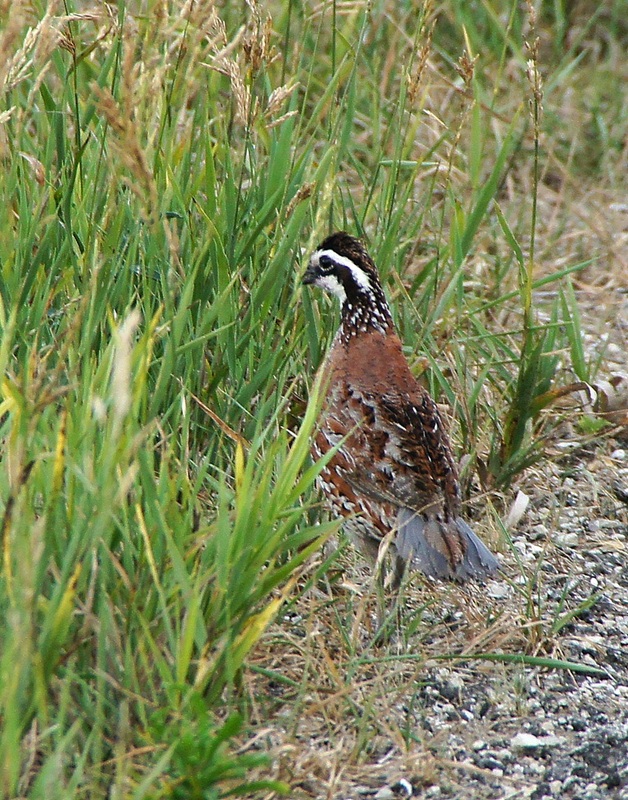 I'm glad I was able to get these photos, as I've always wanted to get some decent photos of a Bob White Quail. They are usually pretty elusive and more "heard and not seen". My brisk walk with Mr. Bob White was Saturday evening. Sunday evening, I ran out of the house to photograph some Whitetail Deer who were visiting my backyard pond. You'll have to stay tuned to this blog for photos of the deer. Sunday night, I took a fall (no, I wasn't chasing any critters at the time) and tore my rotator cuff in my left shoulder (yes, I'm left-handed too... lucky me). So, unless I can figure out how to lift the camera, zoom the lens, focus, etc., with one hand, I probably won't be taking any photos for awhile. :-( I'm outta commission for a little while. Don't worry, as soon as I have my arm functioning again, and the pain subsides, I'll be back to chasing and photographing my critters. Take care of yourself Misty, we'll miss your great photos of the critters. Heal fast. Love the Quail photos. LOL! This would so totally be me - and how exciting to finally be able to "shoot" one with your camera. What a cute little bird he is! Sorry you were hurt, I hope you recover quickly. I love the Bobwhite, a very pretty bird. Great shots. Have a wonderful weekend and thanks for hosting. sorry about the injury! heal quickly! i love the bob white. haven't seen one since my younger days in wisconsin! Actually, there are small pockets of the quail somewhere in the state...but I don't know where. Great shots! We have then come up by the sprinklers when the weather is hot like it has been...try as I may I have yet to get a clear shot of one. Hope you heel quickly...don't push yourself to do too much too soon. Ouch! Hope you heal up soon! Ouch- that hurts! Hope you heal fast so you can get back to chasing the critters. I've only seen the gambles quail....these images you've captured are superior Dawn!! Just wanted you to know that I added a linky to my newest bird photos today. If you'd care to stop by and leave a link. And perhaps if you know of anyone who loves birding--let them know of the new birding meme I set up for a weekly run---The Bird D'Pot. Stop by if you can. And have a glorious week. It is a lovely little guy! Thanks for sharing! Have a great weekend!